Under attack from the right wing of the Tory party and from our side, government are now in a state of paralysis over the Immigration Bill. Andrew Lansley, leader of the House of Commons, said the Immigration Bill is ‘subject to the progress of further business’. In practice this means that the Bill is unlikely to make any further progress until February. On January 16th Lansley explained that the Bill would progress “in due course”. This gives us more time to oppose it before further consideration in the House of Lords and House of Commons. The Movement Against Xenophobia organised a meeting in the House of Commons on 15th January (with speakers including David Price, chair SYMAAG) The meeting aimed to brief parliamentarians on the likely results if the Bill becomes law and was very well attended as the picture below shows. 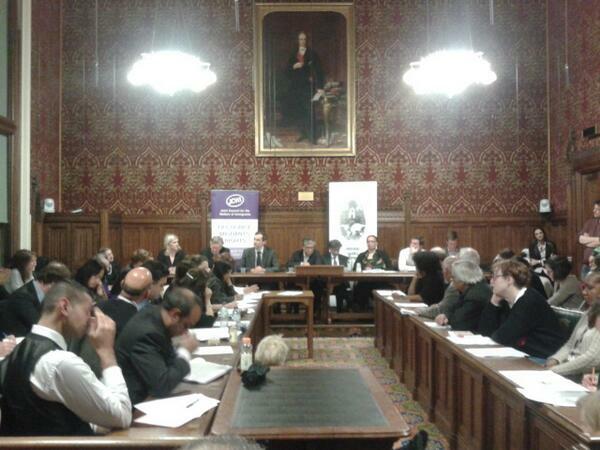 Brief reports of the meeting are on Twitter at #stoptheimmigrationbill A full report of the meeting will follow. The Bill, described by one MP as “the most racist piece of legislation I have seen in 30 years” aims to create a “hostile environment” for what Theresa May calls “illegal migrants”. In practice it will lead to racial profiling as healthworkers and landlords and are left to assess people’s immigration status before they are allowed to access services or to rent a house. 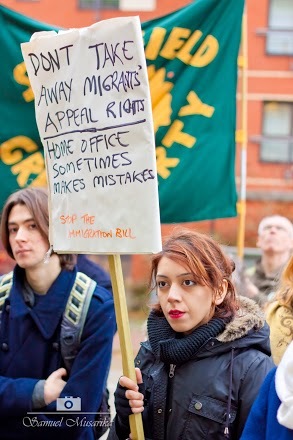 Appeal rights are to be reduced, despite a third of appeals succeeding in challenging wrong initial decisions on asylum claims. There is opposition to the Bill: migrant and human rights groups, organisations representing healthworkers, landlords and the UK’s biggest trade union UNITE. The UNHCR recently condemned the Bill as creating “a climate of ethnic profiling” and saying that it “stigmatised refugees in the public mind”. 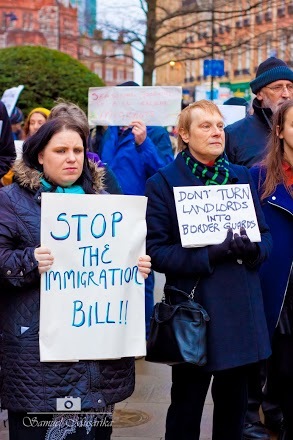 120 people showed their opposition to the Immigration Bill in Sheffield on December 18th on a demonstration organised by SYMAAG and supported by migrant rights groups from around the UK, unions including UNITE, the local Save Our NHS campaign, churches, Labour councillors, MP’s and the Green Party. 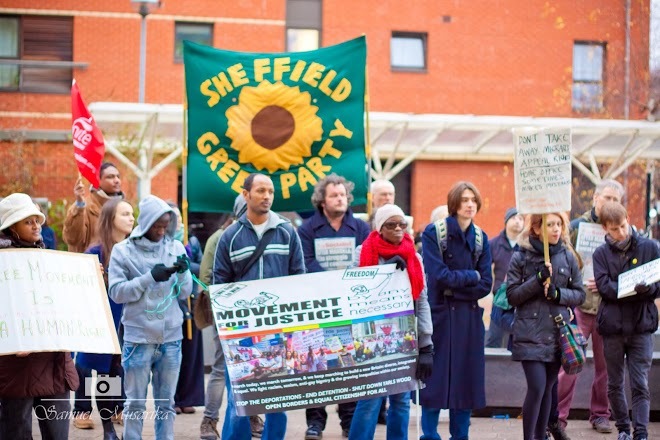 The Sheffield Star newspaper reported the demonstration including a video with an interview of Green Party leader Natalie Bennett. Latest news: On February 5th the Public Accounts Committee questioned G4S and Serco about their failure to provide asylum housing fit for human beings to live in. And why it could cost us up to £1.5billion public money paid to private accommodation providers to do this. This follows the damning National Audit Office report into privatised asylum housing. 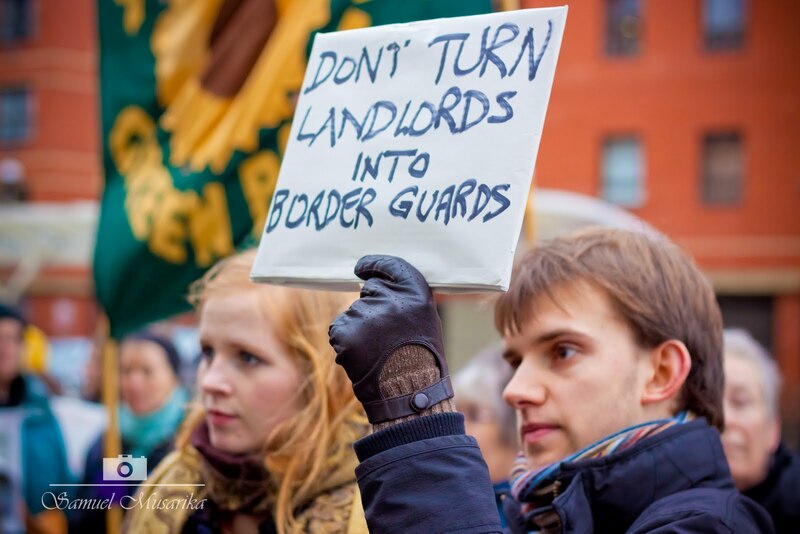 Amongst other things the February 5th hearing found that 50% of asylum housing was unfit for habitation! The full transcript is here and a full analysis of the results of the hearing will be published by SYMAAG’s John Grayson soon. The National Audit Office report on the COMPASS asylum housing contract describes “poor performance, delays and additional costs”. This confirms what asylum seekers and SYMAAG have known for nearly 2 years saying that G4S (and Serco) “place asylum seekers in sub-standard housing” according to a BBC report on January 10th and that “the government had failed to enforce its own targets“. Yet another reason to Stop G4S feasting on public funds as they abuse human rights in the UK and around the world. A national meeting of the Stop G4S network will be held in Sheffield on February 8th, 11-5pm at the Quaker Meeting House, 10 St James Street Sheffield S1 2EW. The building opens at 10am on the day. The meeting will bring together all those opposed to G4S’ attempts to profit from abusing human rights in the UK and around the world. 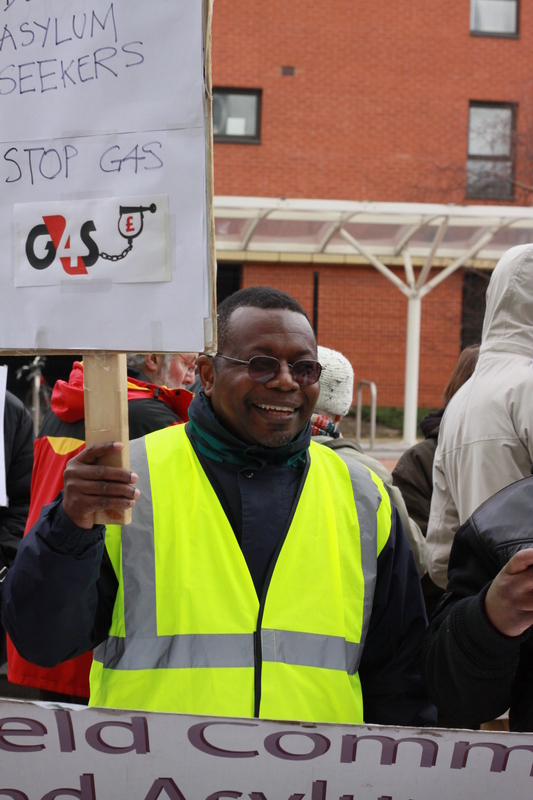 Since the successful founding conference of Stop G4S in October 2012 the company have continued to be awarded global contracts despite their well documented abuses and incompetence. A local Stop G4S network has been established in Sheffield, bringing together asylum-rights activists, Palestinian solidarity campaigners and anti-privatisation trade unionists. On February 8th we – and many others – will come together to plan our ongoing campaign against the company. John Grayson of the South Yorkshire Migration and Asylum Action Group looks at the politics of scapegoating. This is not the first time Blunkett’s words have inflamed tensions and heightened a toxic political discourse. In 2001 he claimed that the riots in northern cities were not the result of provocations from far-right activists but caused by the ‘parallel lives’ lived by Asians in Bradford; and argued that those involved (often third generation Asian migrants) had to get used to the cultural demands of living in Britain. In fact in 2001 Blunkett not for the first time ‘conflated immigration and race’ with his calls for citizenship classes and language lessons, as though those involved were foreign. ’We have norms of acceptability’ he said shortly before the report into the disturbances was released. ‘And those who come into our home – for that is what it is – should accept those norms just as we would have to do if we went elsewhere.’ This is exactly the case he was making regarding Roma in his constituency – this time mixing anti-Gypsyism, race and immigration. Thus the moral panic Blunkett’s recent statements have created in the media and in political discourses he could have easily predicted as an experienced politician and former home secretary. Over the past twenty years European Roma migrants and refugees have become more visible in South Yorkshire. In the 1990s Bosnian and Kosovan Roma fled to the UK from civil war and bombings. Small numbers became resident in South Yorkshire. In 1991 a virtual pogrom in the Polish town of Mlawa forced the emigration of Polish Roma. For the first time some chose to flee to the UK as asylum seekers. Before 2004 Roma from Central and Eastern Europe wanting to move to the UK to escape persecution had to do so by claiming asylum. They were some of the first to get caught up in the British government’s hardening attitudes to asylum seekers in the 1990s. When the notorious Yarl’s Wood detention centre opened in 2001 there was a hunger strike of twenty-five Roma detainees. In fact the place of Roma people in the UK abusive asylum system has often been overlooked. For instance in September 2013 it was the courage of a Roma woman in the same Yarl’s Wood centre which has exposed sexual abuse and exploitation of women asylum seekers. In 1997 400 Czech and Slovak Roma with their 580 dependents sought asylum in the UK. Very few were allowed to stay but a single family of Slovak Roma settled in Sheffield in this period. It was this family which became the basis for the later major migration of Slovak Roma to South Yorkshire between 2004 and 2006. In Leeds in 2005 there were campaigns by local Gypsy and Traveller organisations to ensure that Kosovan Roma, settled in the city, were not deported. In South Yorkshire just prior to the 2004 Enlargement of the EU, there was a local campaign in Sheffield by activists and the Sheffield Star which prevented the deportation of Frantisek Lagron a Czech Roma man with his pregnant wife and three children only weeks before they would have been legally resident in Sheffield. Barnsley had the largest number of Roma asylum seekers in the region before 2004, many of them were from the A8 accession states and some of them have now settled in the town. There is anecdotal evidence of some local hostility in 2003 with a Bosnian Roma family being forced out of one of the Barnsley council estates. The major arrival of Roma workers was after 2004 and mainly to areas in Rotherham and Sheffield. In practice South Yorkshire has become a base for migrant Slovak Roma workers, from three villages, (Bystrany, Pavlovce and Zehra) and a regional city centre (Kosice) in Eastern Slovakia. This was classic ‘chain’ migration. A Roma family had settled in Sheffield prior to 2004 and had contacted families and friends in their home area of Eastern Slovakia who gradually joined them after 2004. They in turn contacted other extended families in the same areas. In 2007 researchers estimated the Sheffield population of (mainly Slovak) Roma at around 1,200. In April 2009 European Dialogue in research for the then DSCF (Department for Schools, Children and Families) suggested an estimate from interviews with Roma people for Sheffield of between 3,000 and 4,000. This is the same as the current (2013) figure which the recent study by Salford University quoted from information from Sheffield City Council, presumably mainly based on the 2009 research. 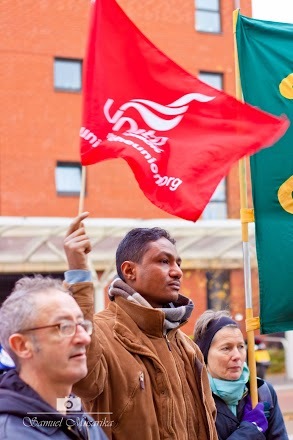 The Salford research did not include data from interviews with Roma workers or their families. The exposure of ‘hidden’ populations of Roma was no doubt well-intentioned, to improve resources devoted to Roma integration into local communities, but statistics are constantly ‘racialised’ and misused, and the media used the research in scare stories about the numbers due to arrive from Bulgaria and Romania. The truth is of course that population data for Roma is in practice ‘unknown, manipulated and contested’. Statistics on migration from other EU countries to the UK is not ‘ethnically disaggregated’ – in other words only a person’s nationality appears, not their ethnicity. Moreover Roma people have still much to fear from being counted and researched. Two weeks after Blunkett’s speech in Sheffield in the central Banská Bystrica Region of Slovakia an ultra-right, anti-Roma candidate Marian Kotleba was elected as governor of the region. The ongoing dire situation in the Czech Republic for Roma has been highlighted by a recent protest meeting at the House of Commons. In 2007 hundreds of Romanian Roma were rounded up in Italy under an emergency decree and deported back to Romania. Since then the Italian authorities have finger printed Roma children which to Roma people is a sinister reminder of their treatment by the Nazis before the ‘O Baro Porrajmos’ (‘The Great Devouring’ – the Roma Holocaust). Even in Sweden, where over the past few years tolerance and liberal attitudes have been challenged by far-right movements, the Nordic Roma have found themselves threatened. The Roma language is an official language in Sweden and it is illegal to create directories or official files on ethnic minorities. Despite this, in September 2013, the Swedish daily newspaper Dagens Nyheter revealed that police in Malmo had drawn up a file in 2009 in the form of a genealogical tree covering 4,029 Roma, many of who had no criminal record and more than 1,000 who are children. French Roma evictions a model? It is therefore not surprising that Gypsies and Travellers and European Roma people in the UK are hesitant to declare themselves as Roma. They have been seen as ‘illegals’ and ‘beggars’ for much of the last five hundred years in Europe and would have certainly seen the summer ‘Go Home’ campaign of the Home Office as addressed to them. In research in Rotherham in 2007 one Slovak Roma man when asked whether he would describe himself as ‘Roma’ or ‘Gypsy’ said that he avoided the term ‘Gypsy’ because he had never heard it spoken in English … only as ‘f***ing Gypsy’. In Barnsley in 2008, a Romany Gypsy man terminally ill with cancer recorded himself as such on the hospital form when he attended for treatment. He and his family had lived in Barnsley for around a hundred years – he was sent a bill for his treatment as a ‘foreign’ non EU citizen. Ian Birrell, a speech writer for David Cameron in the 2010 election, on the 29 November spoke of ‘a depressing week for British politics as it takes another sordid step into the stinking gutter of xenophobia.’ For Roma people in Europe it has been a very depressing autumn. In the middle of October, the international media seized on an alleged case of a white child being ‘stolen’ by Roma in Greece. The media frenzy which ensued resurrected almost Mediaeval stereotypes of Gypsies stealing children and selling them (or ‘trafficking’ them in current jargon). In the UK for some bizarre reason the British press headlined the discovery of a white child in a Greek Roma camp as giving ‘hope’ to the parents of Madeleine McCann. In fact on 12 September the Telegraph had already linked the McCann case to the alleged discovery of an ‘Italian Madeleine’ ‘snatched by Gypsies’; another white child seized by Greek police from Roma in Kos in Greece. In Yorkshire the mother of Ben Needham a youngster from Sheffield who disappeared on the Greek island of Kos over twenty years ago wanted access to DNA samples from the Greek Roma child seized in central Greece, to investigate whether Ben was her son. On the BBC Look North programme from Leeds on 21 October she claimed that she had always thought that the ‘Gypsies had been involved in Ben’s disappearance’ but the Greek police had been too frightened to investigate in Roma camps. ‘Bid to trade a newborn child for cash is said to have taken place amid an outbreak of drug dealing, teenage prostitution and gang intimidation in Sheffield’s Page Hall district…. The fact that this deluge of press vitriol against Roma families surfaced around the Blunkett statement was particularly poignant in South Yorkshire. In the Rotherham parliamentary by-election of November 2012, where UKIP came second to Labour in its South Yorkshire heartlands, journalists understood very well that the case of the ‘UKIP couple’ who had been barred from fostering children, which Nigel Farage, the leader of UKIP, used incessantly during the campaign, was in fact the local authority following legal rulings on the placement of Roma children. The underlying anti-Gypsyism of UKIP’s campaign was widely seen as aimed at mobilising antagonism against Rotherham’s 3,500, mainly Slovak Roma population. Roma organisations in Slovakia and the UK through press and TV coverage in Slovakia and street demonstrations in Bratislava in September 2012 had protested about allegations that British social workers had taken away 120 children from 40 Slovak Roma families. There was even a debate in the Council of Europe in December 2012 on the issue. Even before Blunkett’s interview the Express on the 31 October was linking the Salford University research to Page Hall under a photograph of Farage who had exploited the Roma issue in Rotherham. Ciaran Jenkins, Northern reporter for Channel 4 News, coincidentally had reported on Page Hall on the 30 October, mainly through interviews with local Roma workers and the family of a Roma community worker, and found little to support reports of major tensions. He filed a further report on 27 November on a community in Manchester where Romanian Roma had settled well into local life and were not seen as a ‘problem’. Sheffield’s local evening newspaper came to a similar conclusion when it asked the question ‘Is Page Hall really a ticking bomb of racial violence?‘ on 28 November. At a meeting in Page Hall on Wednesday 20 November there were flowers and an apology from David Blunkett for the Roma community. There were also local Labour councillors who decided to shut down the advertised public meeting and tried to exclude national Roma representatives of the new Europe Roma UK organisation and supporters of the local Roma community. The councillors simply refused to sit down with what was a cross section of people from Sheffield organisations, and experienced researchers to openly explore and discuss ways forward for Roma people in Page Hall. Labour is refusing to oppose the Coalition’s draconian Immigration Bill now in Parliament. Yvette Cooper the shadow home secretary’s response to what the Daily Express on 28 November called David Cameron’s ’Crackdown on EU Migrants’, was to claim on the ITV News on 27 November that the measures were too late, and ’should have been introduced eight months ago’ when Labour called for them. The BBC’s ‘neutral’ political editor Nick Robinson also joined the fray on the ‘crackdown’ on EU migrants. According to Robinson, reporting on BBC News (27 November 2013), Cameron’s statement was a populist response to the fears of the public as shown in opinion polls, and in the newspapers, that Britain was a ‘soft touch’ on benefits. Robinson speculated that David Cameron was probably smiling about outdoing UKIP, when ‘the Brussels bureaucrats were slagging him off’ (sic). Politicians and the British media attempted to use the Page Hall moral panic to create an atmosphere where Roma communities could be targeted and alleged Roma ‘criminals’ and ‘beggars’ could be deported – exactly the policies followed in Italy and France in recent years. In 2012 police in London working with invited Romanian police personnel organised a drive to ‘clean up’ homeless Roma from the streets of central London. In June 2013 over 60 Roma were evicted from the former Hendon FC grounds where they had lived for over two years and offered flights ‘home’. English and Irish social services have seized Roma children on a regular basis to put them into ‘care’, only later to return them without apologies to their families. It is important that anti-racist campaigners work in solidarity and alongside Roma organisations and Roma communities to respond to these attacks. Stanley Cohen, in his work, Folk Devils and Moral Panics (1972) first coined the term ‘moral panics’. He defined the concept as a sporadic episode which, as it occurs, subjects society to bouts of moral panic, or in other terms, worry about the values and principles which society upholds which may be in jeopardy. He describes its characteristics as “a condition, episode, person or group of persons [who] become defined as a threat to societal values and interests.” [Cohen, 1972 p.9] Cohen goes on to discuss the way in which the mass media fashions these episodes, or stylises them, amplifying the nature of the facts and consequently turning them into a national issue, when the matter could have been contained on a local level. Grayson J., Horton M., and Petrie A., The European Roma of South Yorkshire (2007). Sheffield Star, 1 March and 25 March 2004. Pred A., Even in Sweden: racisms, racialised spaces, and the popular geographical imagination, London: University of California Press (2000). P.37 Hancock, I. ‘The Struggle for the Control of Identity’, Transitions, 4(4): 36-44 (1997).